Home / Review / Let’s EAT! Do you know what’s more difficult in Los Angeles than trying to navigate the 405 at 5pm on a Friday? Trying to buy a home that’s not a teardown, and not listed at some astronomical amount. After one particularly trying morning of looking at houses in the North Hollywood area, I decided I needed something to eat. Something a little comforting like eating at breakfast at home on the weekend. A little brunch to lighten the day, if you will. I’ve lived in North Hollywood for a significant amount of my eight years in LA in a variety of different parts. I’ve always loved the area, the people and the shops. One of the more notable parts of it is the tiny pocket near Lankershim and Magnolia known as the North Hollywood Arts District. This pocket of revival is filled with theaters, dance troupes, restaurants and bars while also being home to the end of the Metro Red Line and the Television Academy. It’s one of the few walkable spots in Los Angeles and a great spot for spending a night out in. Along Magnolia, next door to the incredibly amazing Republic of Pie is a place I had never visited before: EAT. The restaurant looks really tiny if you’re just passing by, but with the combined outdoor and indoor seating, it didn’t take long for us to get a seat even on a busy Saturday. 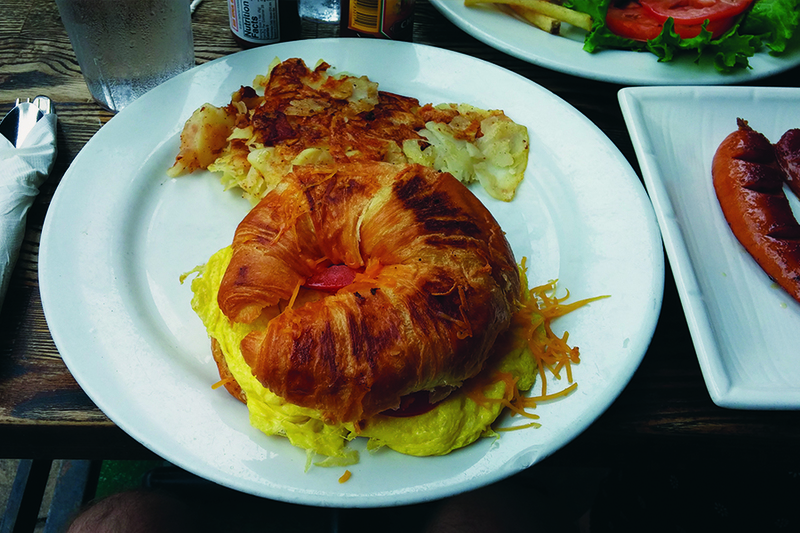 The menu is a reasonable size, offering breakfast as well as lunch items. While the burger and lunch sandwiches sounded excellent, breakfast was calling my name. The Breakfast Croissant is stuffed with scrambled eggs, bacon, cheddar cheese (the reason I went with this over the American cheese topped Breakfast Bagel), avocado and tomato. To go all out for breakfast I got a side of breakfast potatoes and hot links. Look, it was a trying morning on a house search, so lay off. This breakfast sandwich was incredibly satisfying. 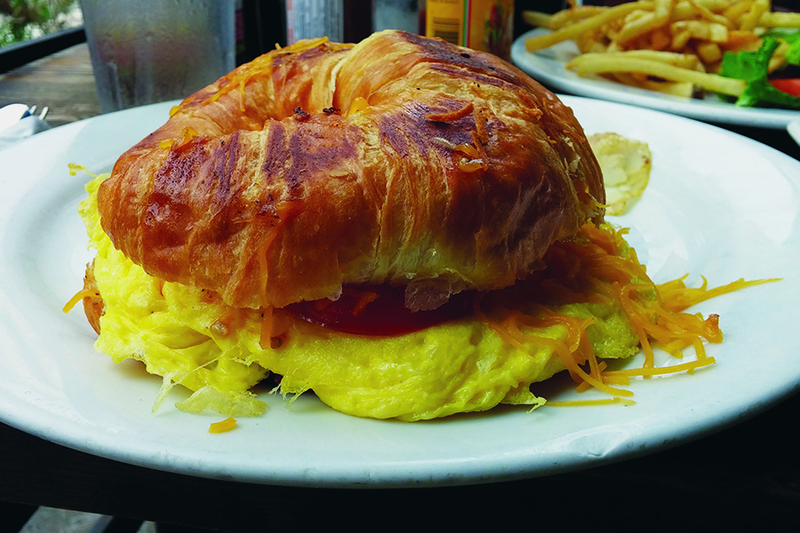 The buttery croissant permeated the sandwich and was an excellent contrast to the salty bacon and savory eggs. The avocado added to the creamy buttery flavor of the croissant while the tomatoes added a fresh flavor to cut through the heavy breakfast. The shredded cheddar cheese was the best option for tying all of these ingredients together. I also added my friend Cholula hot sauce to the breakfast to give it a kick with some vinegary bite. It’s always a great addition to anything with eggs. Combined with the side sausage and potatoes, this was an incredibly filling brunch that kept me going until late at night and continued the trend of incredible eateries on Magnolia Boulevard. 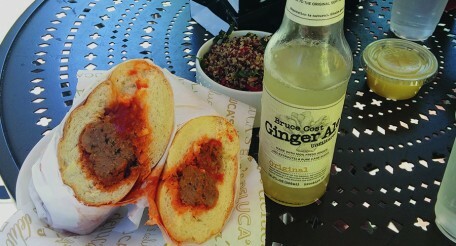 If you’re ever looking for a great place to eat, then EAT should be your stop in NoHo. Then swing on into Republic of Pie for dessert. Maybe The Brickyard Pub for a drink. Then….Bow and Truss for dinner?